The 2010 Tournoi International du Poinçonnet youth basketball tournament has come to an end with France beating Spain (43-35) in the final match. With this victory France successfully defended the trophy in a repeat of the 2009 final match. 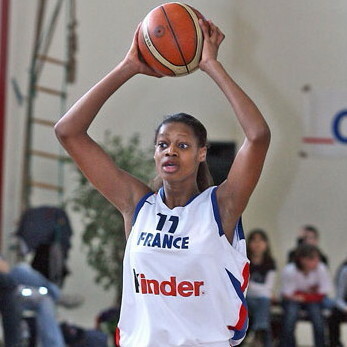 Valériane Ayayi was the match winner for France with 17 points and 10 rebounds. In the first match of the day Poland held off a late surge by Belgium to win (67-63) in the match between the two teams without a victory. Olivia Epoupa (right) was selected as MVP and was joined in the all tournament team by Marles Balart, Antonia Delaere, Dominika Miloszewska and Valériane Ayayi. The coaches from both sides would agree that this was not a good game to watch. There were too many errors and a bad day from beyond the arc with both teams combining for (0-31). France also had a bad day from the free-throw line with just 9-from-21. However their strength in rebounding with Lidija Turcinovic and Valériane Ayayi (left) gave them the edge at the interval (29-16). Spain's steady free-throwing (15-of-19) allowed them to reduce their deficit as the game went on. But unfortunately this was not enough to stop France from winning the game. 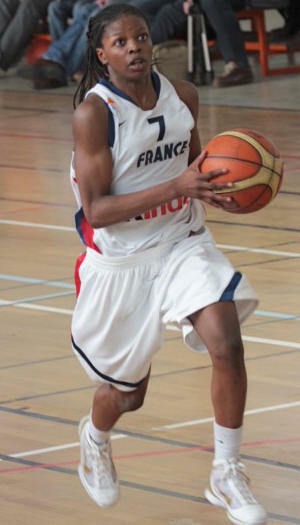 Ayayi was the player of the match with 17 points and 10 rebounds for France. She was the only player in double digits. 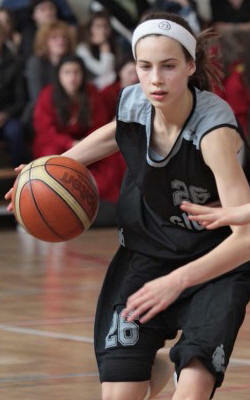 Lidija Turcinovic who scored 4 points picked up 10 rebounds also. For Spain Marles Balart (right) was everywhere. She gave the French players a lesson in free-throwing with her 7-from-9 attempts. Balart finished the game with 13 points. Laura Aliaga was the other player in double digits. France: Marième Badiane 4, Céline Pfister 2, Lidija Turcinovic 4, Olivia Epoupa 7, Mamignan Toure 3, Awa Sissoko 2, Imane Brahmi 0, Valériane Ayayi 17, Lisa Cloarec 0, Axelle Koundouno 2, Aby Gaye 2, Assitan Kone DNP. Spain: Deborah González 0, Rocío Torcal 3, Patricia Soler 0, Elena de Alfredo 0, Gala Mestres 3, Marta Montoliu 2, Laura Marín 4, Belén Arrojo 0, Laura Aliaga 10, Ana Carlota Faussurier 0, Laura Correa 0, Marles Balart 13. 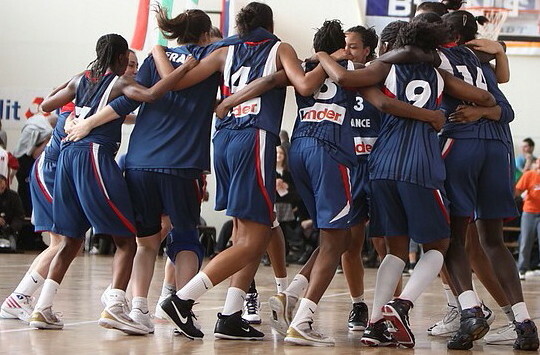 This victory for France ties the international youth basketball series against Spain for the 1994 generation players. It was clear early on in this game that Poland were not going to experiment much with rotations. They started with their strongest five players and only took them out when they committed fouls. On the other hand Belgium continued their policy of rotating players in the first 20 minutes before settling for the better performing players at the end. Poland profited from the frequent changes in the Belgium line-up to win the first quarter (18-9) and maintain that advantage up to the break (33-24). The two teams raised their game during the second half. They reduced the turnovers and finished with a flourish of baskets. Dominika Owczarzak (right) was the leading player for Poland. She finished the game with 20 points and 4 assists. But it was her perfect free-throw shooting (7-of-7) that was to make the difference in the end. Katarzyna Jaworska and Karolina Puss had a strong finish to the youth basketball tournament. If Belgium had played in the first half in the way they played during the second half, they may have won this game. They committed too many unnecessary fouls allowing Poland 35 trips to the free-throw line. Antonia Delaere (left) was the motor in this team. She finished with 13 points but dished out 7 assists and was credited with 2 assists. Hind Ben Abdelkader led the Belgium team in scoring, 16 points. On the balance of play Poland deserved the victory in this game. Overall both teams improved as the tournament went on and their coaches should be pleased with what they saw. This tournament is only the first step in their preparation for the U16 European Championship Div A later this summer. Poland: Monika Skrzecz 0, Malwina Rudzka 3, Dominika Owczarzak 20, Julia Drop 0, Maja Rynkiewicz 0, Julia Adamowicz 0, Daria Marciniak 2, Wioletta Wisniewska 0, Dominika Miloszewska 13, Karolina Puss 10, Katarzyna Jaworska 13, Beata Jaworska 8. Belgium: Antonia Delaere 13, Nette Van Oeckel 0, Hind Ben Abdelkader 16, An-Katrien Nauwelaers 0, Saar Bogaert 6, Janne Roggemans 0, Heleen Adams 11, Jolien Goyvaerts 4, Josephine Anseeuw 0, Camille Lebrun 0, Jille Van Meerbeeck 0, Malon Humblet 11, Axelle Bernard 2.